Even though they may have been considered just another prog supergroup in the early years of the new millennium, The Tangent always stood apart from similar projects. Built around the creative heads of Andy Tillison and Guy Manning, two artists who showed their adoration for everything related to Van der Graaf Generator and Peter Hammill already in their earlier collaborative bands Gold Frankincense & Disk Drive and Parallel Or 90 Degrees, The Tangent was initially enhanced by members of Flower Kings from Sweden and former VdGG saxophonist David Jackson. Much time has passed since then, and it’s incredible how busy The Tangent have been. Not counting the two official live albums, Down And Out In Paris And London is already their fifth longplayer. Unlike other supergroups who seemingly can’t evolve their sound, The Tangent prove less rigid. This is for instance their first album where they are an all-British band. Drummer Paul Burgess made himself a name as a long time member of art rock band 10cc. Bassist Jonathan Barrett may not be that well known yet, but he is a more than adequate replacement to Jonas Reingold. Theo Travis on saxophone and flute is a sought after session musician and manages to insert a healthy dose of David Jackson styled woodwinds into the mix, which can best be heard on the nervous The Company Car. A short hour may seem a long running time for those rather used to pop standards, but compared to their previous records, Down And Out In Paris And London (which stole its title from George Orwell’s first novel) is a rather compact and concise effort. The CD starts with the nineteen minute long Where Are They Now?, a regular tour de force through the different aspects of progressive rock music. The same is repeated on the album’s final thirteen minute track Ethanol Hat Nail which flirts with the Canterbury brand of prog rock… at one time the guitar sounds suspiciously like Steve Hillage’s on Gong. The middle songs are shorter and consequently more accessible. Paroxetine – 20mg is a surprisingly straightforward rocker that deals with depression. Perdu dans Paris is a poetic ballad whose sincere drama saves it from triteness, and so perfectly arranged that you can hardly believe it’s twelve minutes long. The Company Car is the shortest track with only six minutes, but also my favourite moment on the album. 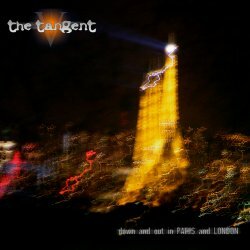 The Tangent can once again convince on Down And Out In Paris And London. I prefer the more accessible middle part to the more playful long tracks that begin and end the CD. Unlike Transatlantic, another prog supergroup on the same record label, whose latest release feels like a rehashing of old patterns, The Tangent’s approach of recycling comes with some ironic distance, making the final result a lot more palatable. Art rock fans with a taste for the Seventies will have a great time with this one hour long prog rock journey!